People in the South West are being asked to unite with thousands of others across the UK and step closer to a cure for Parkinson’s. Parkinson’s UK has launchied Walk for Parkinson’s 2018 and the charity is inviting people of all ages and abilities to sign up to a walk near them. Walks in the South West include the South West Coastal Path in East Devon on Sunday 24 June, which is a brand new walk for 2018, and Ashton Court in Bristol on Sunday 30 September. There are shorter and longer distances to choose from, so whether you’re up for a challenging walk or a gentle stroll, there is something for everyone. Team entries are welcome, so why not sign up with your friends, family and colleagues. He said: “We want to make 2018 our biggest year yet for the Walk for Parkinson’s series. I’d like to invite everyone, whatever their level of fitness, to take advantage of the many different types of walks, scenic routes and distances available. Exercise can be really beneficial for people living with Parkinson’s. It is as important to me as my medication in helping me take control and manage my symptoms. “So please join us at one of our Walk for Parkinson’s in the South West. Every step takes us closer to a cure and our goal of improving the lives of everyone affected by Parkinson’s”. Last year’s Walk for Parkinson’s series had more than 4,300 people sign up to walk and between them they raised £417,700. In the South West more than 220 walkers got involved and raised £22,300. 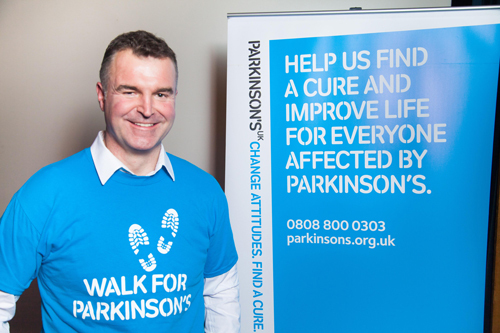 All money raised by Walk for Parkinson’s will be used to help find better treatments, and ultimately a cure, as well as providing support and information for the 145,000 people affected by Parkinson’s across the UK.